NOW AVAILABLE AS A BOOKLET! 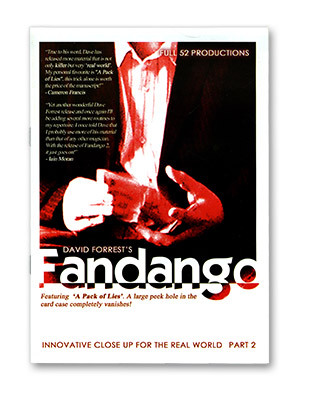 Part 2 in the 'Fandango' series continues with yet more innovative close up magic with the focus firmly fixed on practicality and real world performance. Six more, never before published effects fresh from the mind of Dave Forrest. The material contained within has been carefully selected to ensure that the 'Fandango' ethos remains true. This is not a 'read it once' release. These are effects that you will actually use in the real world for real people. Fandango Part 2 - THE SAGA CONTINUES! Four Found Fast - An extremely visual yet relatively easy production of four of a kind. While it looks very flash and impressive, technically, it's an absolute breeze! No Hassle Hof - An eye-popping handling of 'The Hofzinser Ace Problem'. This is cool, visual card magic that you'll start using immediately! Carrots, Ok? - A close up 'psychometry' routine - you always know who holds the odd coin. This is an almost impromptu miniature mentalism act in and of itself. A Pack of Lies - A very weird effect! During the course of an 'expose', you somehow cause a large hole in the card case to completely disappear! The clever gimmick makes it practically self working!